View, create, and edit Office documents on your iPadÂ® with touch-friendly Word, Excel, and PowerPoint apps. For years, whenever someone bought a new PC for their home or business, they usually bought Office to go with it. PCs aren't selling as they used to, though. IPads and other tablets have become attractive substitutes for many PC functions. Last year, global shipments of PCs fell 10 percent from the year before, while tablet sales grew 68 percent, according to the research firm Gartner. By the end of 2015, tablets should be outselling PCs by a wide margin, Gartner said. This year Gartner expects 271 million tablets to be sold versus a total of 277 million desktop and laptop computer. Microsoft said that its Office iPad apps would be free to people who want to use them in read-only mode. But to create files on the iPad, users will have to pay an annual subscription fee for Office 365, the name for the latest version of Office. The Office 365 subscriptions cost $70 or $100 annually, with the lower price placing more restrictions on the number and types of devices that can be used. 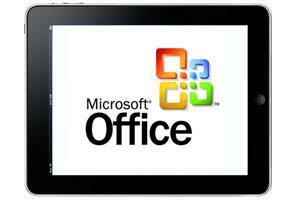 Microsoft is likely offering a free version in response to both Apple's and Google's free mobile office suites. Apple offers iWork for free (iOS 7 and up) on its new devices and Google offers QuickOffice for Microsoft is working on bringing Office to Android tablets, as well as a Metro version for touch-enabled Windows devices. Microsoft Office Mobile on the App Store on iTunes | View, create, and edit Office documents on your iPadÂ® with touch-friendly Word, Excel, and PowerPoint apps.